The defining High Fantasy storyline. The quest means business. Quests feature The Hero and a bunch of supporting cast members traveling across the world with a firm goal in mind: to recover a McGuffin, collect all the Plot Coupons, Save the Princess, defeat the Big Bad, or all of the above. Quite possibly an Impossible Task, to get rid of him. Will usually involve lots of incidental minor adventures, running into oracles and wise men, fantastic creatures and damsels dispensing items that may help you on your quest. A great device, because it allows the writer to do character interaction and showcase exotic locations, and give The Hero a good reason to Walk the Earth. Used mostly in a fantasy world, but can also take place in a modern or mundane setting with enough work-around. Older versions just set the character off on his quest in the wilderness about them. Often undertaken by Hitchhiker Heroes or people on The Homeward Journey. The problem with such a story from a modern perspective is that they can actually tail off too much into the various side-stories and forget the main goal that the characters originally started out on. This was less of a problem before as Medieval writers often deliberately wrote a network of plots, subplots, and sub-subplots branching out like a tree. Examples of this are Spenser's Fairy Queen, Arabian Nights, and Romance of the Three Kingdoms. Christopher Booker's The Seven Basic Plots separates The Quest from Overcoming the Monster. While both involve a journey, the Overcoming the Monster plot is far more focused on heading straight for the Monster (with perhaps a side quest for magic weapons), while The Quest concentrates on a variety of obstacles including Monsters, Temptations, Deadly Opposites, and a Journey to the Underworld. (This probably indicates that if the heroes don't realize there's a Big Bad to fight until after the halfway point, it's following The Quest plot.) Also, The Quest is the plot most likely to include companions (a small group, or just one companion - or, as with The Odyssey, a Redshirt Army). One Piece: A ragtag pirate crew seek out a massive treasure horde. Pokémon: Ash goes on a voyage spanning the entire globe to bring glory to his name. Wolf's Rain: Four wolves traveling the earth to find the fabled paradise. Inuyasha: A group of demon slayers venturing through Japan to reclaim every shard of a shattered jewel. Berserk, which started out as a Roaring Rampage of Revenge plot, has turned into one of these, as Guts and his companions seek the land of Elfheim in search of a cure for Casca's post-Eclipse insanity. Dragon Ball started out as one of these, with Goku originally leaving is home with Bulma to find the titular Plot Coupons. Common for the more "epic" stories in the Disney Ducks Comic Universe. Though there are many, perhaps the most notable variant is the one where Scrooge and/or his nephews search for a lost legendary treasure or something similar. These exist in more than one variant, too, from Don Rosa's historically well-researched stories to the Italian ones where Scrooge typically kidnaps his relatives to go along against their will to search for something bizarre like the key to time or the gigantic coins of the cyclopes. The Vasyn quest in With Strings Attached. Even though it turns out to be a setup. "Katie Crackernuts": a quest for her fortune, and her stepsister's (although getting away from her mother, who was a Wicked Stepmother to her beloved stepsister was a major factor). "The Feather of Finist the Falcon": to find and cure her love. "The Buried Moon": to find the moon of the title. Indiana Jones, particularly in the third movie, being a quest for the Holy Grail and all. Finding Nemo: A clownfish goes to find his kidnapped son. Monty Python and the Holy Grail, which parodies various elements of the trope. The original Blues Brothers, which involves the duo out to save an orphanage. The Goonies: A group of teenagers seek the treasure of One-Eyed Willy in order to save their town. J.R.R. Tolkien's Lord of the Rings and its prequel The Hobbit. Lord of the Rings was unusual in that, unlike the fantasy sagas that came after, the hero was not on a quest to acquire some item of great power, but to destroy one. Even with that, Word of God states that Frodo failed in his quest when he was on the verge of completing the quest. The ring is only destroyed when Gollum takes the item in question. According to Arthur, King of Time and Space, they did that too. In Watership Down, somewhat unusually, the protagonists' quest is simply to find a new home where they can live in peace. During the Denouement of James Swallow's Warhammer 40,000 Blood Angels novel Red Fury, Rafen is told that Fabius Bile got away with some "sacred vitae" and is charged with preparing a ship and going after him. The book ends there. In Graham McNeill's Warhammer 40,000 Ultramarines novel Dead Sky Black Sun, Uriel is sent, as punishment, on a quest to find and deal with a vision that a Chapter Librarian had. The vision contained neither locations nor names for him to identify. The Odyssey—possibly the first novelistic Quest in the West—to return home and defeat his wife's suitors. Exodus—a quest to escape Egypt and found a new nation in the Promised Land. Around the World In 80 Days—a quest to do exactly that. Journey to the West and its many adaptations, including Dragon Ball and Saiyuki. 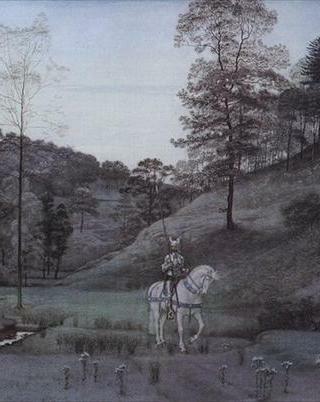 In John Barnes's One for the Morning Glory, all knights are supposed to go on a quest. Sir John is sent after Waldo's heart because he had never performed a proper quest before. In James Thurber's The 13 Clocks, Prince Zorn is sent for a thousand jewels, to be found within ninety-nine hours. The first few Shannara books. In the Percy Jackson and The Olympians books, the occasional quest is standard for the demigods being trained at Camp Half-Blood. The books themselves follow the various quests of Percy Jackson, with the quests heavily influenced by ones undertaken in Classical Mythology. All Redwall books will include a quest as one of their Two Lines, No Waiting. In Michael Flynn's The January Dancer, the harper claims that the quest is not important, since the object must be a MacGuffin: it's Jason and Medea that matter, not the Golden Fleece. In a two-parter on Criminal Minds, "The Fisher King", the unsub frames his crime in the pattern of a quest, including macabre clues and even a damsel in distress...one chained to a bed and scheduled to die if the team doesn't find her. In the Doctor Who serial "Underworld", the Minyan crew's guiding principle is "The quest is the quest." They are rather stunned with success, but when they realize it will only take three centuries to get where they are going, they are delighted. In "The Fisher King" episode of Merlin, Arthur goes on a Quest to get the Golden Trident and prove himself worthy of the throne. Subverted as it turns out Merlin was the one really on the Quest and the Fisher King gives him water from the Lake of Avalon. Arthur still gets the Trident and Merlin, Arthur and Gwaine are named Magic/Courage/Strength as a Trio by Grettir, the watcher of the bridge. Happiness Stan Suite by The Small Faces. "The Fountain Of Lamenth" and "Xanadu" by Rush. Older Than Dirt: Gilgamesh went on a quest for Immortality, travelling through dangerous supernatural locales to find the survivor of The Great Flood. Every single hero myth ever, across any culture, relies on this. The Greeks and Romans had stories like Jason and the Argonauts, Hercules, and the Aeneid, with heroes being sent on quests by a god or a king. In later Europe many legends were based around knights going in search of holy objects or to save a kingdom or a damsel or something to that effect. I'm not to familiar with myths of other cultures, but I know other mythologies relied heavily on it as well. More RPGs, Adventure Games, and Action Adventures than you can count. Many with the name "Quest" in the title. Usually, accurate. No Rest for The Wicked, based on Fairy Tale "The Buried Moon" involves a quest to retrieve the moon. In fact if you want to get technical, it was kicked off by Roy's father's quest to defeat Xykon. Eugene swore a Blood Oath to defeat Xykon, but eventually decided it was more effort than it was worth, and ended up dying of natural causes before anything was done about it; the end result being that Roy didn't really have much choice in the matter since, as Eugene's blood, he was beholden to the oath as well. Homestuck. Build up, get through the gates, fight the denizens, kill the Black monarchs...though the kids are often more concerned with their own hijinks. Looking for Group has Cale's epic-expanding quest to settle and rebuild Kethenecia. In Rusty and Co, two at once. In Impure Blood, Dara explains /ib024.html they are -- or at least she is -- on a quest to find the last of the Ancients. In Consequences of Choice The Characters are on a continuously changing quest, all with the same intent, keeping the Invisus hidden. In Sinfest, Slick's laptop goes searching for him while he's missing. The whole point of Greek Ninja. Sasha Hunter sets out on one with her team, well, several of them, all leading to the ultimate goal of eliminating a power dangerous to the world. This page was last edited on 26 September 2018, at 02:11.